Using thin slabs of white earthenware clay I cut , manipulate and stick shapes to form light , bright pieces that sparkle and glow. Bright colours , a crisp glaze and gold lustre enhances the reflective quality of the work. 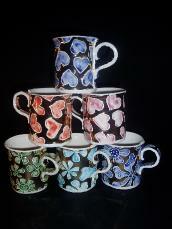 As each piece is formed it takes on it`s own character from the twinkling humble mug to the tall proud jug. Having trained at Loughborough , I now live in Cornwall. My work sells in galleries throughout Britain, from The Isles of Scilly, to the top of Scotland.